If you want to get to the top in life, you have to be prepared for some uphill battles. To reach the top of Skåla (1848 m), you won’t find a longer uphill stretch in the whole of Norway. Mount Skåla is poplular both for hiking and for ski touring. This is a spectacular hike with views of fjords, mountains and glaciers. Nowhere else in Norway will you find a bigger difference in altitude from fjord to summit. Walking here on the old stone-paved paths and stone steps, with fantastic fjord landscapes as far as the eye can see, is a true cultural experience. You can spend the night in the tower, or the new Skålabu cabin at the summit. The tower was originally built as a sanatarium to cure illness, and the place hasn’t lost its remedial qualities, as there can scarcely be anything healthier than fjord views and a cool glacial breeze. Mount Skåla has also become popular for skitouring. From the parking lot follow the tractor road which later becomes the path upwards in Fosdalen. Cross the river at about 650 meters height. Then go 400 meters hight with persistent steep slopes up to Skåla lake. Continue southeast to the bottom, and from here take the left towards the broad ridge leading to the peak. Downturn the same way. The trip to Skåla can, be done all winter without great danger of avalanches, but it requires good visibility and good judgement. Let this trip to wait if there is rain or fog! This is a moderate / strenuous hike of approx. 5 hours. The trip starts almost by sea level, in the parking lot about half kilometer from the Loen center. We highly recommend using a guide. Guided ski touring by Breogfjell and Uteguiden. The distinctive Mount Skåla towers 1,848 metres above sea level. In 1891, a round tower was built with three-tier bunk beds sleeping 22. The tower, which was the brainchild of Dr Hans Henrik Gerhard Kloumann, was built to provide recreation for body and soul. From his home at Faleide, he had a beautiful view looking up the fjord with the majestic Mount Skåla in the background. 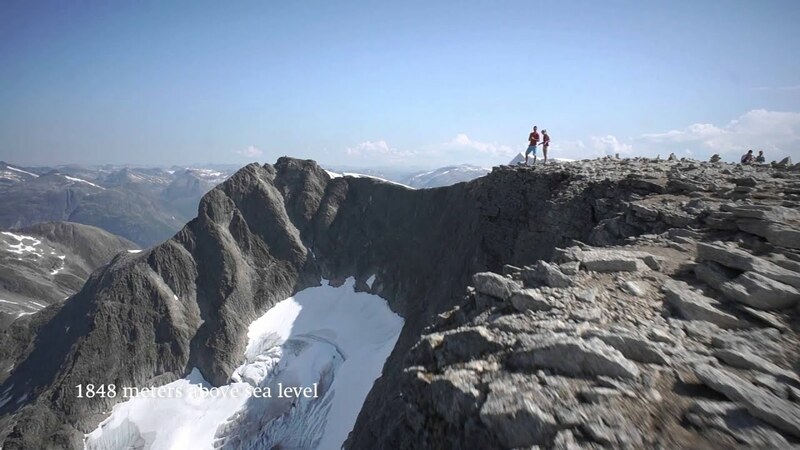 Mount Skåla is reckoned to be Norway’s highest mountain top with its ‘foot in the sea’. The Skålatårnet tower is a self-service cabin run by the Norwegian Trekking Association (DNT) and it is without doubt Norway’s – and perhaps the world’s – most unique tourist cabin. Spectacular views in all directions make a midnight visit to the toilet an unforgettable experience. In autumn 2016 the Skåla Tower got a neighbor: Skålabu. A new cabin with room for 22 persons. The tower and the cabin are run by Bergen Turlag (Bergen Trekking Association). Skåla has always been a popular mountain destination, and many people have run up the mountainside to try and break the uphill record. The Skåla Opp uphill race is organised every year in mid-August. Skåla Opp is Norway and Northern Europe’s toughest uphill race. Loen sports club and Loen Active organise the race. Both competitive and fun-run categories. Loen is the closest stop for public transport (bus), and there are good bus connections from Oslo and Bergen. Local buses leave the transport hub of Stryn several times a day. You can also book a taxi to take you to the starting point. Loen is located 11 km from the centre of Stryn. If you are driving, turn off towards the Lodalen valley and drive appr. 2 km until you arrive at Tjugen and the starting point for the walk. Parking fee. Loen has many accommodation options. Hotel Alexandra, situated just 2 km from the walk’s starting point, is known as one of Norway’s best hotels. There are many campsites and cabins in Loen and up in the Lodalen valley. Good to know - "Be aware that the mountain drops very steeply to the north. This side often has a big overhanging cornice. Keep a very safe distance, especially during winter and spring. The walk has been graded as ""Expert"" because of the tough climb (0-1848 m.). The path is very good." Parking - When you pass Tjugen camping on your left handside, continue for 150 metres until you reach a parking place on your right handside. Parking fee. In Loen you leave the main road and follow the sign that reads Lodalen. Drive up the valley for a couple of km. When you pass Tjugen camping on your left handside continue for 150 m until you reach a parking place on your right handside.